Bahman Golbarnezhad was competing in his second Games. Bahman Golbarnezhad (left) was 48. AN IRANIAN CYCLIST has tragically passed away after sustaining head injuries in a horrific crash during today’s Paralympic Road Race in Rio. Bahman Golbarnezhad died after suffering a cardiac arrest on the way to hospital. He was 48. In a statement released this evening, the International Paralympic Committee (IPC) confirmed that Golbarnezhad was involved in a crash at around 10.40am local time on the first section of the mountainous course. The cyclist received treatment at the scene and was in an ambulance when he suffered a cardiac arrest. Golbarnezhad passed away soon after his arrival to Unimed Rio Hospital, close to the Olympic Village in Barra. The Iranian Paralympic team were told of the news as a group in the Athlete’s Village this evening. “This is truly heart-breaking news and the thoughts and condolences of the whole Paralympic Movement are with Bahman’s family, friends, and teammates as well as the whole of the National Paralympic Committee (NPC) of Iran,” Sir Philip Craven, IPC President, said. The Iranian flag has been lowered to half-mast in the Village while a minute’s silence will be held during Sunday’s Closing Ceremony at the Maracana. This was Golbarnezhad’s second Games after he competed in London 2012. He had finished 14th in Wednesday’s C4 Time Trial. The incident caused delays to the rest of the day’s Road Race events in Pontal, a small seaside resort in Rio. An investigation into the circumstances of the accident has been launched by the IPC and organisers will stage a press conference at the Olympic Aquatics Stadium later. 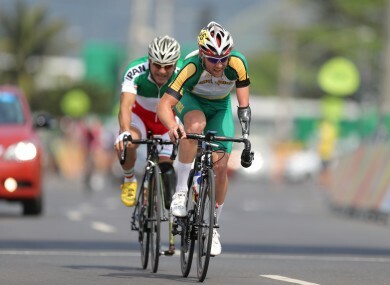 Email “Paralympic cyclist dies after suffering head injuries during today's Road Race ”. Feedback on “Paralympic cyclist dies after suffering head injuries during today's Road Race ”.